CONT [V]: During your turn, for every 2 face-up cards in your G-Zone, this unit gets Power +5000, and your <Zodiac Time Beast> rear-guards get Power +1000. Time Leap – AUTO [V]: During your turn, when your <Gear Dragon> or <Zodiac Time Beast> G-Unit Strides, choose up to 1 card in your hand, call it to R, choose up to 1 of your rear-guards, and time leap it. AUTO [R] GB1: [Put this unit into your soul] When one of your other units is placed on R from outside your hand, you may pay the cost. If you do, search your deck for up to 1 <Zodiac Time Beast> with the same grade as that unit, call it to R, and shuffle your deck. Today’s cards we’re introducing is a 《Gear Chronicle》 Grade 3 alternate version of Chronojet, “Chronojet Dragon G” as well as the First Vanguard “Chrono Dran G”, both from the Trial Deck “True Zodiac Time Beasts” (on sale September 30th, 2016)! 〈Gear Dragon〉 or 〈Zodiac Time Beast〉 Strides it, lets you use its Stride Bonus to Call 1 card from your hand, then you can Time Leap one of your Rearguards. Also its Continuous Effect lets this card gain 5000 Power for every 2 face-up cards in your G Zone, and all of your 〈Zodiac Time Beast〉 Rearguards gain 1000 Power for every 2 face-up cards in your G Zone! So it’s reasonable to expect it’ll have a key role in a Deck centered around Zodiac Time Beasts! With the appearance of the alternate “Chronojet Dragon G”, it’s noew possible to include a total of 8 “Chronojet” in your Decks, so now you have an even greater chance of Riding “Chronojet”! Up until now, Fighters have had to worry about the possibly of going the whole Fight without seeing a copy of “Chronojet Dragon”, now they can do so without worry. Including “Steam Fighter, Balih” means you have essentially 12 “Chronokjet”, thus expanding Deck Construction options! 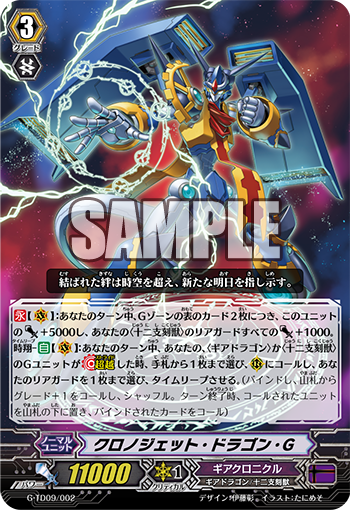 “Chrono Dran G” is a new First Vanguard candidate that supports <Zodiac Time Beast>. Since its ability’s activation condition is “When it’s Called as a Rearguard from anywhere other than the hand”, meaning it works well with 【Time Leap】! Together with these new “Chronojet” and “Chrono Dran”, let’ seize a future filled with victory!